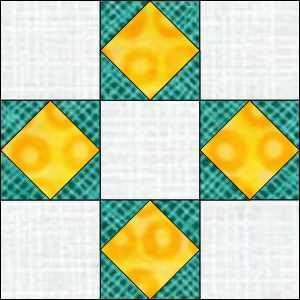 Square-in-a-Square quilt blocks can be puzzling to figure out for die cutting, because they usually involve on-point squares which have funky measurements. Here’s how you can convert them easily for die cutting. What is an On-Point Square? I often get asked the difference between regular squares and on-point squares, because in the die-cutting world, these are typically named differently. 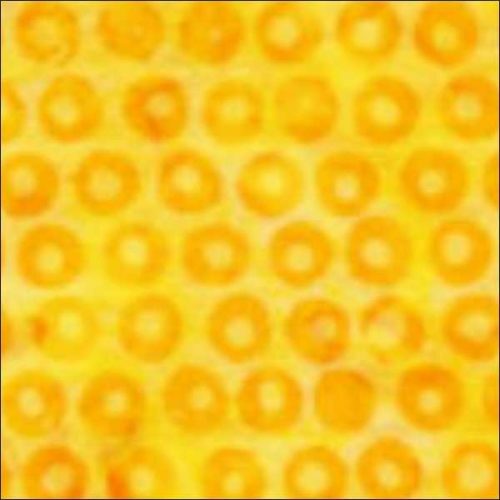 At the end of the day, squares are squares: a geometric shape with four equal sides. All squares are cut on-grain, so that you have two parallel sides cut with the lengthwise grain and two sides cut on the crosswise grain. The difference between a regular square and an on-point square is how it gets used in a block. A regular square is used as above… when you make the block, all the square units are oriented in this direction. So for 9-patch, Irish Chain, Churn Dash, etc. 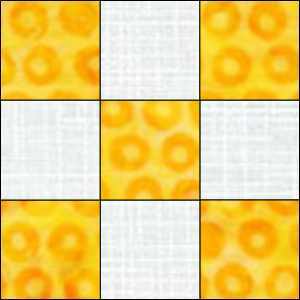 – the squares are all oriented at 90-degree angles to each other. Here’s where the sizing gets a little bit funky, and why I prefer die cutting anything that involves funky measurements. If I wanted to know what size to cut a square, you can see that involves measuring the length of one side, which you can do across the center of the block. Can you see that to take the same measurement for an on-point square, it’s not the length of the side, but the diagonal measurement across the center? Some die manufacturers produce on-point square dies for common finished sizes, but they aren’t always labeled as such. Instead of coming up with complex formulas for figuring out on-point squares and corner units, I’m going to show you how to easily figure this out using my Equivalent Die Notation (EDeN) System. 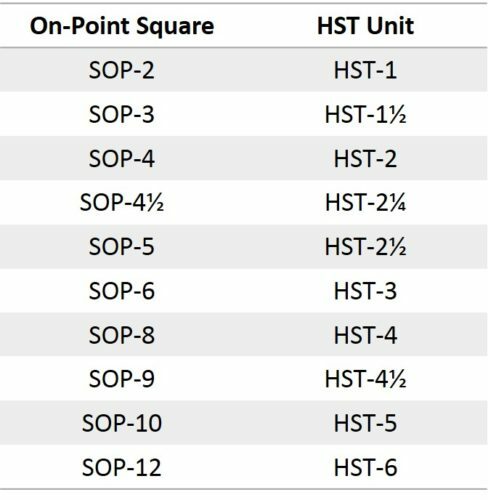 Instead of calling these on-point square units, in EDeN I call them Square-on-Point or SOP units, because I wanted them to appear in the chart next to the squares. Before we get to the chart, I want to call your attention to something about the on-point square. Can you see that if you divided this unit in half in both directions, you could make this unit completely from HSTs? Here’s where the power of using the EDeN System really starts to shine! If there’s an SOP unit that doesn’t exist, I could just replace it with two QST units of the same finished size, and I can make the same block. So if by chance I can’t find or don’t have SOP-6, I can just use QST-6, make two flying geese units instead with HST-3, and end up with the same size block. And if I didn’t have the QST die? Well, as I showed you above, you can just use all HST units instead. Sometimes with rotary cut patterns, it’s a little challenging to figure out what type of unit you’re going to end up with, because sometimes that pattern is using a shortcut method for making units, or they are oversizing the unit to square up down the road. My best advice is to do a little bit of detective work in the pattern. Read ahead in the instructions to see where these units end up or how they are constructed. Lots of times a pattern will give you unfinished measurements for sub-units, which allow you to back into a measurement. 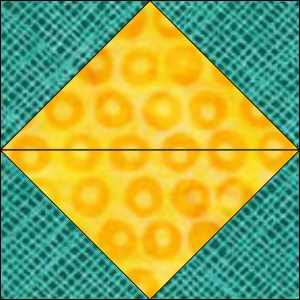 For example, if you have a pattern that goes through a few steps, finally arrives at this square-in-a-square unit, and tells you it should measure 3½” unfinished, well you know that would be 3″ finished, and you can use the dies for SOP-3 and HST-1½. Sometimes you are given cutting instructions directly for the on-point square; in that case, you can go to the SOP section of the EDeN Chart, and read the Rotary column, until you see the measurements that match up with your pattern. From there, you can see which SOP size that corresponds to, and look up the coordinating HST as well. You can see that in the EDeN Chart image above. Over time, I have come to memorize some of these rotary cut measurements, and they just trigger for me whenever I see them in a pattern. 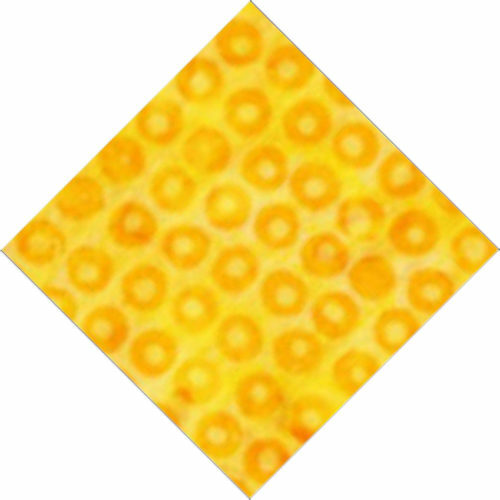 Many of the common ones are so unusual that it would be unlikely to be used any other way that as an on-point square. For example, 3-5/16″ I just know is for a 4″ finished square, so that’s SOP-4. That’s not something I can teach you – it’s just something that over time, you get used to, just like using EDeN. You’ll find these exercises less taxing over time if you remember to write the EDeN Numbers on the sides of your dies. I usually write this on two adjacent sides so I can see the EDeN Number in all the variations of my storage units. As you use your dies more and more to translate patterns, you’ll appreciate being able to just look them up by EDeN Number instead of having to scrutinize each die shape. AccuQuilt makes a product called a Qube, where they come up with coordinating dies and sell them together as a set. The confusing thing about the Qubes for some people is that they named these sets based on the finished size of a 4-patch block, not the size of the grid that block is based on. Well, it’s possible that the shapes you want are available across multiple Qubes (so you end up with duplicate dies) or they are in a Qube set that you wouldn’t necessarily associate with your finished block. 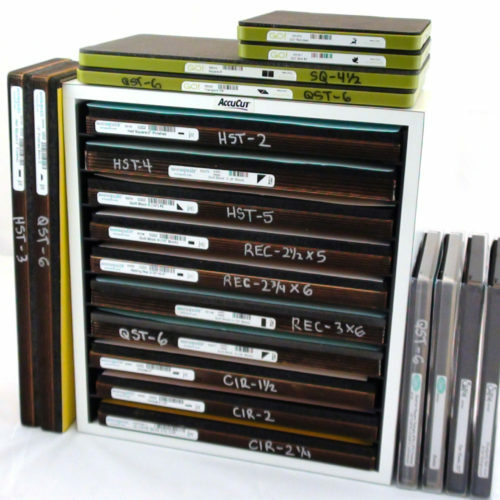 For example, if you’re making a 6″ finished square-in-a-square unit, you would actually need the 12″ Qube for both shapes; however, you will find the HST-3 you need in both the 12″ and 6″ Qubes. Either way, I’ve added the Qube shapes to the EDeN Chart in the GO! Column, so in the event you want to label your Qube shapes as well, you can add the EDeN Number to those dies. What other blocks or patterns can EDeN help you make? Is there a block that has you stumped? Tell me about it in the comments!